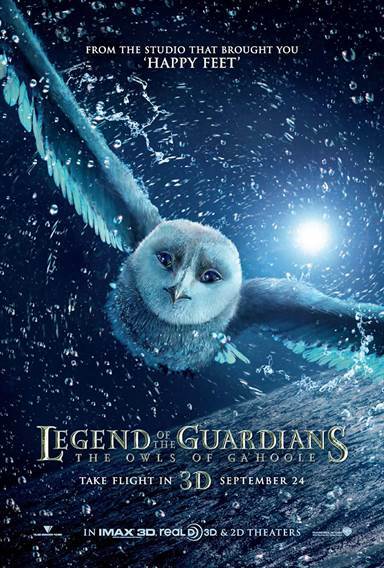 Download Legend of the Guardians: The Owls of Ga'Hoole in Digital HD from the iTunes store. Legend of the Guardians: The Owls of Ga'Hoole images are © Warner Bros.. All Rights Reserved. Legend of the Guardians is based on a book series of the same name. It is about a young owl named Soren who dreams of one day becoming a guardian of Ga'Hoole and fighting noble battles. Naturally these books were adapted into a movie. Directed by Zack Snyder of 300 fame, the trailers for the movie came off a bit difficult to translate if you weren't already familiar with the book. It is also an ambitious attempt on his part considering his last two movies featured high violence. The movie opens with our young Soren who is a barn owl, voiced by Jim Sturgess, who has grown up listening to stories of the legendary guardians of Ga'Hoole who protect the innocent and uphold justice. Soren's brother Kludd isn't as impressed with these stories and would prefer to do things his own way than live up to some fairy tale. One night as they are attempting to learn how to fly they accidently fall to the ground, which is unfamiliar to an animal raised in a tree, and they are kidnapped by a group of evil owls. When they finally arrive at their destination they are told that must either join up as a soldier or become a slave. Naturally Soren wants nothing to do with either of those options so he attempts to fight back and almost gets himself killed. His brother, of course, is intrigued by the opportunity to achieve power. Soren makes a friend named Gylfie (Emily Barclay) and with the help of a surprise traitor, they are able to escape the evil mountain fortress so they can enlist the help of the guardians. Along the way they make some new friends by the names of Digger and Twilight. The group does their best to help one another and arrive at the tree of Ga'Hoole. Naturally there Soren meets his hero and learns how to become a guardian himself. Eventually they all must travel back to free the other slaves and stop this insidious plot. While the movie certainly looks stunning, as CGI generally does, it is marred by underrated musical score and a difficult plot to follow. If you have never read the books you'll find yourself spending most of the movie feeling a bit confused by everything going on. The other problem is that this movie is obviously geared towards children and yet it is tonally quite dark so some parents may not feel inclined to let their children see it. Zack Snyder knows how to direct action and even in this movie that much is obvious. The problem is that he clearly doesn't understand how to adapt an established piece of fiction onto the big screen. Some may already understand this after seeing Watchmen. This movie will probably do fairly well and may even get a sequel but for the most part anyone who enjoys a good animated movie may want to skip this particular one.